The Ronald McDonald Care Mobile was recently visited by the family of a young boy who lived on a rural Nevada farm. He arrived with his mother and little sister. His mother shared that her son’s teacher had referred them to the Care Mobile for dental services. The teacher had shared with the mother that the staff on the Ronald McDonald Care Mobile worked great with children and offered a sliding fee payment program to help low-income families. The little boy was seen for a complete exam and a dental cleaning. During his examination, a rare condition was identified that prevented some of his permanent teeth from growing, leaving large gaps between existing teeth. The dentist explained to the mother that her son needed to see an orthodontist to fix all gaps between his teeth. The mother was concerned about being able to afford an orthodontist. She shared that her husband was the only one with income in the household. She explained that she barely had enough money for her son’s visit to the Care Mobile. 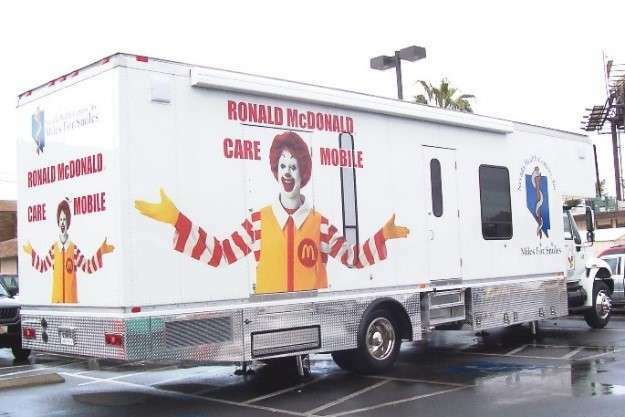 Staff quickly explained to her that she didn’t need to worry about the cost of the visit and explained that the Ronald McDonald Care Mobile has grant funding to cover children’s dental care in rural areas. The staff also asked the mother if she wanted her daughter to be seen that same day and shared that all charges for the visits would be taken care of through the dental grants available. The mother was thrilled and agreed to have her daughter seen on the Care Mobile that same day. The staff shared with the mother that the Nevada Health Centers team on the Care Mobile could help her submit a Medicaid application for her children and explained that if they were approved Medicaid would pay for her son’s orthodontic care as well. The mother couldn’t believe how helpful the entire team had been. Just recently the Ronald McDonald Care Mobile had another visit from the little boy for a 6-month check-up. He was doing well, showing off his braces as well as how much he has grown. Ronald McDonald House Charities of Greater Las Vegas and Nevada Health Centers are proud to provide preventative and restorative children’s dental care on the Ronald McDonald Care Mobile to children throughout Nevada and we are grateful for the ongoing support of funders, such as Oral Health American, that make dental services possible for so many families.